Tracy Larrimore is an aid to the British Secret Service. Being is an independent-minded young woman of 21 who was seeking some excitement and got a lot more than she expected, Larrimore finds herself in the middle of considerable action. Not an agent herself, she nevertheless becomes enmeshed in international intrigue when the man who hires her is using her as an unsuspecting cover. Soon numerous people want to see her dead and it takes all her luck, and the help of a handsome stranger, to survive. While she is an American from New Jersey, the spy agency she comes into contact with, and thus helps, is British. Larrimore had been living in New York looking for work when she read an advertisement for a secretary which she answered. Surprised to find herself hired on the spot, she was even more stunned when told that her job would require her to accompany her new boss on a business trip to Europe. When the work was done there and her boss left to return, she opted for a couple of days of sight-seeing in London on her on. After one day, she reads in the paper that she had been killed in Paris. So starts the new career of Larrimore as she tries to understand the mistake and gets herself in deeper and deeper. Playing a major role in the Larrimore series is the British agent Mike Thompson who saves her, loves her, marries her, and along the way gets his life saved a time or two by her. In typical romance formula, the relationship takes time to develop but when it does it also brings out the tenacity that makes Larrimore the kind of young woman who would go off on her own like she does. As the new assistant to an international consultant, Tracy Larrimore was excited to travel to Paris on business. Then she read in the paper how she was killed in an accident. That's when the trouble really began. 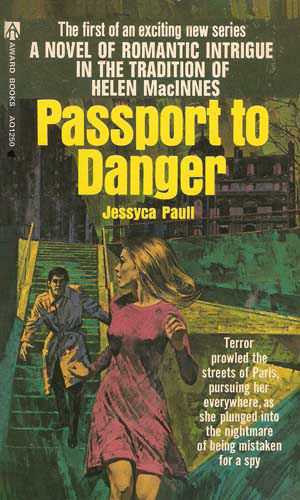 Her secret agent fiance has suddenly vanished and when she starts to search for him, Tracy Larrimore is kidnapped to Luxembourg and the headquarters of the infamour Spider. 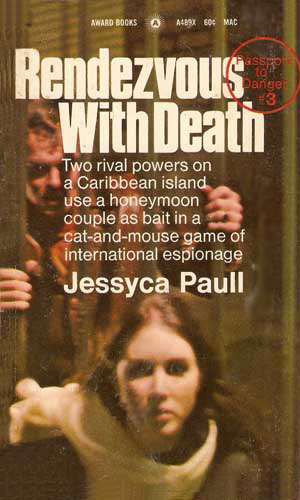 On her honeymoon on a small Caribbean island, Tracy Larrimore's husband is arrested for murder and Larrimore disappears. Knowing someone has discovered his real profession, her husband must prove very good or very lucky to get his wife back. The blurb on the covers describes the series as "in the tradition of Helen MacInnes" and it does strive for that high goal. It doesn't quite make it but it comes close and that in itself is impressive. 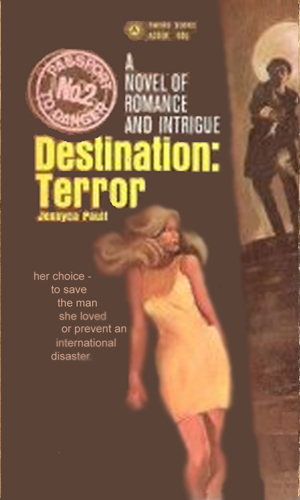 The action in the books is fairly standard but the author is able to convey the idea that it is an inexperienced but independent woman who is having to deal with the danger. She is not a shrinking violet begging for some one to save her. She gets mad and takes actions herself. That these actions are not always the wisest only make them more realistic and enjoyable.